At Engadget’s Expand event in San Francisco, Lenovo has unveiled its first ThinkPad featuring a subtle redesign – the ThinkPad T431s. Gone are the hooked lid and the physical buttons above the trackpad. In its place is a more refined and modern design that remains unmistakably a ThinkPad. 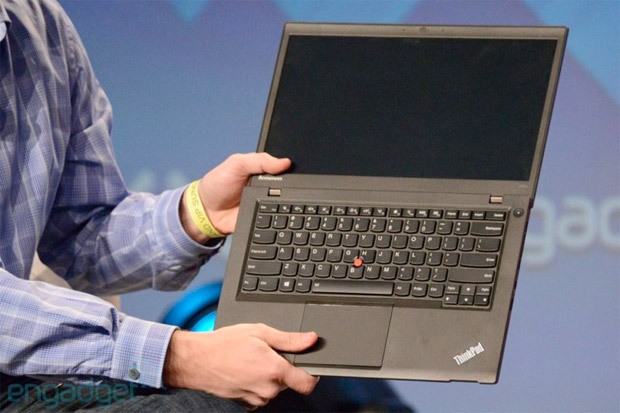 This thin, lean and mean ThinkPad sports Windows 8 (as well as Windows 7) in a 14-inch 1600 x 900 matte display. Like other ThinkPads the T431s offers plenty of connectivity ports, such as Ethernet, VGA, USB 3.0 (two ports), a 4-in-1 card reader, and support for WWAN and Bluetooth 4.0. There is also an optional backlit keyboard, as well as a wide range of processor options (from the standard 2.7GHz Core i5-3337U up to Core i7) and up to 12GB of RAM. Storage options also vary at different price points, from the standard 320GB hard disk up to several SSD options. One other feature worthy of note is the redesigned touchpad on the new ThinkPad T431s. Lenovo spent two years working with Synaptics on new drivers to work on the new five button touchpad, which now supports up to 20 gestures for better Windows 8 interaction. Best of all, at 1.63kg and just over 2cm thick, the ThinkPad T431s is classified as an Ultrabook, but still retains the Mil-Spec 8 standard for durability and ruggedness. The Lenovo ThinkPad T431s will be available in April in the US from $949 (about RM2980).